Caroline Marcum thought she’d escaped the great mistake of her life by leaving Wellfleet harbor, but is forced to face it when she returns, reluctantly, to care for her dying mother. Ridley Neal put his past–and his prison term–behind him to return home to take over his father’s oyster and clam beds. Casual acquaintances long ago, when a nor’easter hits the coast, Rid and Caroline’s lives intersect again. When Rid and two other sea farmers are sued by the wealthy owners of vacation homes who want to shut them down, and Caroline accidentally meets the person she most wronged, they each must learn to trust–and love. 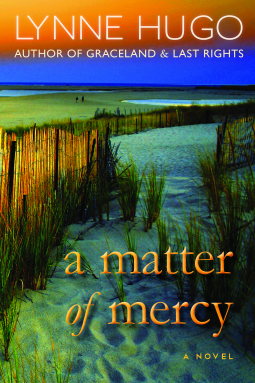 Inspired by an actual 1996 lawsuit, A Matter of Mercy is a riveting novel about treasuring the traditional way of life in the shallows of beautiful Cape Cod bay by discovering where forgiveness ends. And where it begins. My Thoughts: Being that I’m a legal assistant/paralegal full-time, the lawsuit is what drug me into this book. Read what you know right? Ok, so I don’t work in a legal field that anywhere near resembles real estate law, but oh well. I have to say that although Rid and Caroline knew each other in the past, I loved that it wasn’t like an old flame rekindling kind of thing. Hugo used a fresher storyline by avoiding rekindling old love and I thought it served her purpose well. The characters seem a little beat up, rough around the edges, at first. I didn’t know if I should like them or get a restraining order against them, but as the book continues they started to grow on me until I ended up loving them at the end. I didn’t find it to be a book filled with a bunch of legal jargon that leaves you breathless and confused trying to figure out what in the world the author is talking about. It was simple and to the point, and I like that. Overall, I was pleasantly surprised by the book and would recommend it for a good summer read.